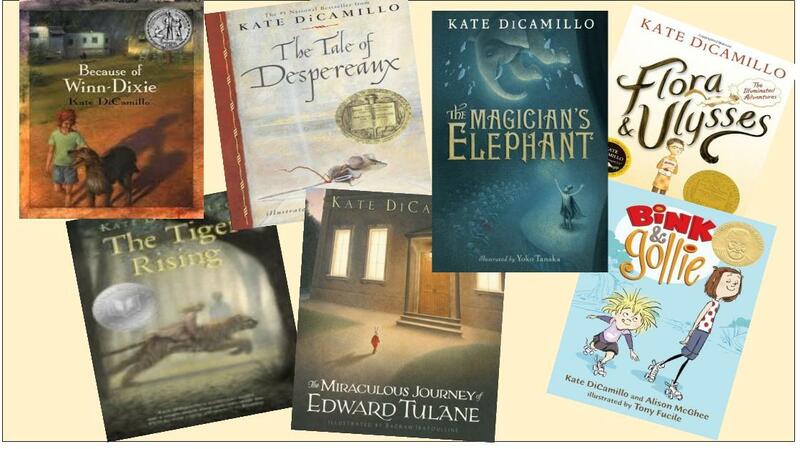 This is how my students and I speak of DiCamillo and her books. I pretty much read them in order because that's how they came out for me but my school kids read them in any which order and they recommend them to each other. Teachers read them aloud and when I say a title the kids collectively swoon, as in "OOOhhhh, Mrs. Tjaden read that to us last year...AAhhhh, it was soooo goooood!" I've heard she has a new one just out. I'm sure we'll love that one as well. 1. Because of Winn-Dixie (2000): Girl and her lovable adopted dog. 2. Tiger Rising (2001): Rob and Sistine make memories with a tiger. 3. The Tale of Despereaux (2003): Mouse + Princess Pea =charming! 4. Miraculous Journey of Edward Tulane (2006): Stuffed rabbit journey. 5. The Magician's Elephant (2009): Peter takes an unexpected chance. 6. Bink and Gollie (2010): Adorable quirky friends, easy reader style. 7. Flora and Ulysses (2013): Flora Belle and a squirrel, yes, for real. Everyone should read Kate; you will be transported into whatever world she has created.